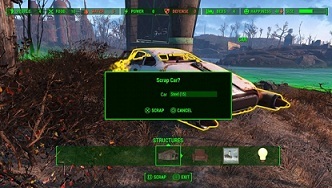 In Fallout 4, pretty much every scrap has a benefit, what was once trash now has its value. Scrap can be found at defeated enemies, in all kinds of tanks and pretty much in every corner of the Commonwealth. If you don’t sell junk as in previous games at the next dealer, you can use them for improving your equipment or the construction of your settlements. Fallout 4 contains an arsenal of 50 base weapons that can be improved with more than 700 mods. Here the scrap comes into play. The following list shows you which scrap is particularly rare and what you can do with it. - Acid: Rare - Application: With acid you can produce particular chemicals, coolants and explosives. You can find this at a chemical station. - Adhesive / Glue: Special - application: adhesive is important for many handicrafts. Use it for making mods, explosives and the settlements. - Antiseptic: Rare - Application: This scrap is used to produce medical and chemical modifications. - Asbestos: Rare - Application: Will improve your energy your resistance, you need this component. Also, you can be produced chemicals and mods. - Kevlar: Rare - Application: With this scrap you can improve your armor. - Circuits: Rare - Application: circuits are necessary particularly in settlements. Installed them into your guns. Some explosives and chemicals will also require circuits. - Crystal: Rare - Application: You will need it to build high-tech equipment and advanced scopes. It requires in particularly to builds laser-based items (laser guns etc.). - Fiberglass: Rare - Application: In addition to the crystals, you will need fiber glass for the production of high-tech goods. - Gold: Rare - Application: This component helps you to build high-tech items. - Core material: Rare - Application: A nuclear Item, to expanding your explosives and advanced objects. Nuclear materials you will need in the workshop menu. However, this reasoning can also be produced easily visors. - Oil: special - application: this scrap requires for armor and weapon mods, but also guns and water cleaner. Silver: Rare - Application: Silver is used primarily for the production of weapons-Mods. The below a list scrap you should collect in any case if you stumble upon them and also we list the rare materials, which you can gain from it. If you have scrap gold which you don't need or get new one then you have a choice to sell this and get new one which is for you. And here is buying all kind of gold.